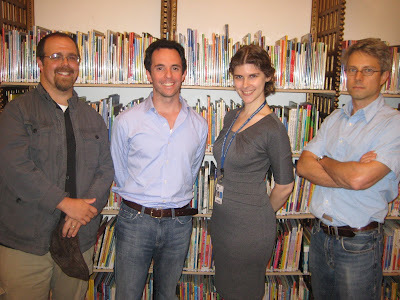 The New York Public Library children's section, under the sure stewardship of Betsy Bird, hosts a regular program called the Children's Literary Café. The theme of the one I had the honor to participate in: "Men Who Write Children's Books, Live in the New York City Area, and Shave Irregularly." It was standing room only and a discussion that (for me, anyway) ended too soon. The audience was most gracious and mostly non-face-shavers (i.e. women). Use the key above to match the name to the facial hair. You get one freebie: Betsy is the one in the dress. 9/14/09 addendum: Betsy's post about this. Scieszka sports a soul patch. That's what those beatnicks call it anyway. Just enough facial hair to be able to say "that guy's not a banker". Sorry I couldn't be there. I really wanted to come, and as I haven't shaved since early July, my beard is home to a family of nesting pigeons.